no big dill: Super Slush and $1000 Gift Card Giveaway! Super Slush and $1000 Gift Card Giveaway! Sometimes it's wearisome to go to the grocery store, and I'm not talking about dragging the kids around, saying no to the things they want to put in the cart, and trying to conjure up from my memory everything I put on my "list" (aka the I-can-remember-that list in my mind). I'm talking about avoiding the high fructose corn syrup, and the preservatives, and the artificial flavors, and the artificial colors and and and. Like I said, wearisome. During the school year, I only let the baby dills take water, 100% fruit juice, or chocolate milk (without high fructose corn syrup, of course) in their lunches. Olive came home from school one day to tell me of a girl in her class who brings two cans of orange soda to lunch every single day. Does she drink them? Both? I asked. Yes, she said giggling. I didn't know what to say to her except, I'm sorry, you have a mean mother. So, a little more variety is always nice, to keep their lunches interesting, but difficult because I still want something healthy. When I opened up the box of Capri Sun Super V juice drink (a mixture of 100% fruit and vegetable juice), I was curious how they would react. I wondered if the older ones who can read VEGETABLE right on the juice container might instantly rebel. The younger ones would be going purely on taste. So?! Azure and Clover were the first and they were delighted, especially because it was on a hot day and I sent them outside to eat. They came back in, wanting more! I ate one (because I was the "control" of the experiment and really like that it wasn't as sweet as a regular fruit juice. Just knowing I was enjoying a refreshingly cool snack all the while ingesting one of the most nutrient-laden foods made me feel a bit...smug. Olive ate hers slushified, Pearl ate hers slushified, and Divine opted to just drink hers, chilled. I sat there, eyebrows raised, waiting for the complaints of "not sweet enough", or "tastes funny", but they never came. Not only did the complaints never come, everyone had another, and then we had to pick a number between one and ten for the last juice because 4 of them wanted it! Lucky number 9 was the winner. Olive was crushed, and there might have been tears. I consoled her by telling her we could just go to the grocery store and get another box the next time we were there. Such drama around here. I'm looking forward to rotating these in school lunch choices. Meanwhile, I have quite an impressive giveaway for you. It's a sweepstakes for a Grand Prize of a $1,000 Visa Gift Card and $500 (runner up) gift card! What's your healthful secret? Do you have to sneak in vegetables, or do your kids just eat them up? I was compensated for my time in conducting this review, but the opinions are my own. We will have to give these a try. High fructose corn syrup is a big no no in our house as well. Thanks Katy. Wow! what a great idea! I love their 100% fruit juice but adding a veggie is even better! We do veggies with every meal...and I find that every day is different, some times they love them and sometimes they refuse! The only constant is that if they know how they grow and where they come from they are much more interested!! We give veggies fun names like "baby trees" for broccoli. Sometimes it works, sometimes it doesn't. The key is to be consistent and let them see you eat veggies too. Sounds like something I need to try to help kick my Slurpee habit! As for veggies go, after eating them with your family, Garrit has said that "brussel sprouts aren't as bad as [he] remembers." I'll have to learn the Dill techniques to make sure everyone in the family will eat their veggies! This sounds great as we enter back into the school lunch world ourselves. One thing that has helped with veggies at my house was getting them to cook them with me. I made it like our own cooking show. We inhaled the flavors and worked together to make a cold beet soup. That night they dug right in. They were so proud of their own work. to be honest - it wasn't really that great,but now they are open to beets. I think starting out by feeding my kids real foods, pureed or cut up tiny and skipping the jarred stuff has led them to be kids who will eat anything. Spinach in fruit smoothies. Tastes great and kids love the green color! We'll have to try this. I usually opt for the same "mean mom"-ness and pack my kids' lunche so I can control everything they're eating. I'm about to head to the store now, so I will be adding these to my list for sure. As for ways to sneak in the nutrition, smoothies are my trick! I can put all sorts of things in those. Veggies aren't completely gobbled up at my house, with a couple exceptions: my kids LOVE raw carrots and need to prompting to eat them, and my daughter (4yo) loves raw broccoli. She'll ask me to buy it if she sees it in the produce section at the store. Also, both kids love tomatoes, which they get from me. It's basically my favorite food. Haha. I haven't done much to get them to eat these things, they're just foods they'll eat naturally. Other veggies are harder, though and we struggle with those..
My spaghetti sauce has at least three veggie purees in it! My kids eat their veges pretty good. I dont make them eat the ones they really dislike but the rule is "you cant hate EVERY vege".. But I have been known to add cooked mashed pumpkin or kumera to pasta sauce. I alwasy grate veges into mince. But the best one I have found is to have cut up raw veges on a chopping board as I cook dinner. The kids come and talk and snack as I cook. They think they are being sneaky eating the veges for dinner. Little do they know I cut up extra on purpose. We have three kids who vary in their selectiveness (from eats nothing to eats everything). We just keep cycling everything through and when we make a salad us we make at least a small salad of lettuce & carrots for our pickiest. He usually takes a bite to satisfy me and I know someday his palate might open up a bit. Love that you can freeze these and use them as the ice pack! I should preface this by saying that I'm an Aunt who takes care of her nieces during the workweek. Because I'm responsible for them, I can't be the "Stuff-them-with-sweets-and-send-them-home" Aunt. I have to be sure they're eating the right things, and it's rare that they get sweet treats outside of fruit at my house. And because my SIL has an aversion to most vegetables, I've made it a mission to get our girls to eat them. Fruit is always on hand and they're allowed that as a snack... or crunchy vegetables. They love baby carrot sticks and pea pods. Grace the oldest one, is sort of a weird kid--she'd rather eat salad than anything else! In fact, when I'm feeding her dinner and we have a salad for veggies, I have to make sure she eats some of the main dish before I let her have salad, or that's all she'll eat. Juice is always 100% juice but I'm careful how much of that she gets, too--if given a choice, she'd drink that instead of anything else. It's a balancing act. We don't keep Coke and such in the house, and goodies are few and far between because we make them together instead of buying them. She does ask for candy sometimes, but I always tell her that there's too much sugar in candy for it to be more than an occasional treat. I've been giving Super V to my kids too and they love it. I'll keep my eye out for this at my grocery store, my kids love Capri Sun, so hopefully they be willing to try it! The key for my kids in healthy eating is to find the veggie they do like and serve it! My girls love carrots, so I buy the mini carrots and add little containers of ranch, perfect for lunch. My son likes cherry tomatoes- also perfect for school lunches. I;ve discovered that raw veggies are more of a hit with my toddler, especially frozen peas! My sauce usually contains pureed veggies. I try to add them to the pasta or rice that we are having and they will eat them sometimes, but other times it will be the only thing left on their plate. I wish that veggies were as appealing as fruits are to my munchies! Luckily, I don't have to "sneak" veggies into meals because my kids LOVE them! My kids all love veggies, but they have been eating them from the beginning (it was their only option...healthy this, or healthy that). Now they are all older (11, 12 and 13), so to encourage them to make adventurous and healthy choices with food, we look at different recipe books, cook dinners together, go to farmer's markets, and try to grow our own foods. My kids are super veggie eaters. My trick? Grow a garden so they're excited about them! I have a garden and my daughter will eat food straight from the garden, because it is like magic. She will eat most veggies that we pick, but protests veggies from the fridge. I guess she just has a discerning palette and demands only the freshest of foods. I grew up with V8, and now the Vfusions have fruits and vegetables. Also having fruits and vegetables around for snacks helps. This is great! I probably would have NEVER even picked up the capri-sun had you not blogged about it...I would have just assumed they were all the same as usual. Hidden veggies are awesome! What's not to like about all fruits and veggies? My little guy is the pickiest eater I know. We do smoothies to hide veggies, or healthier versions of choc zuchinni muffins. We just act like eating fruits and veggies is normal and then (for us) it is. If my 2 little ones aren't interested at one meal, they almost always are at the next so it works for us. My older one also likes to learn about how different foods fuel her body. Mine have certain veggies they love (peas, celery sticks especially dipped in peanut butter, carrots) and some they absolutely won't touch. I try to offer them a variety of veggies but don't stress too much if they don't eat them. thanks for the giveaway! Sometimes I bake veggie purée into sweets but mostly I put good stuff in smoothies. i just keep a huge bowl of chopped vegetables and hummus out around dinner time, and then all through dinner as a side dish. they gobble them right up. Our 'healthful' secret is house rule #1: If you don't eat your vegetables for dinner, you'll get them cold for breakfast! Cruel, I know. But it amazingly works. My kid loves veggies, so no sneaking needed. I do tend to 'curry' some things like eggplant and zucchini, but that's mostly for my vegetable-dubious husband -- a bit of cumin seed and turmeric does wonders for 'sigh... yet again' CSA produce as well. I used to sneak zucchini into muffins and spinach into smoothies, but now I just give my 3-year-old broccoli or carrots or whatever I have on hand. I'm lucky, he eats it. Some veggies they love (my 3yo and 1yo) but most they hate. I am so thankful for pasta sauce and a garden with fresh veggies (they'll eat tomatoes from our garden but not the grocery store). I have 2 toddlers and one 6 year old. The only one that doesn't fuss about veggies is the littlest one. He's so funny - he stole my cucumber today! Swiped it right off my plate!!! I do wish my other two would be so excited about veggies, though. Those look so yummy! I can't wait for my kids to try them. My heathful secret is dip! Vegtables taste so yummy in dip. Veggies go down pretty easily in our house, but that wasn't always the case. My husband and I made a conscious effort when our girls where just starting solids to not give up on veggies. We figured they would grow to like veggies if we just kept giving them. I'm not sure if our hard work really paid off or if our girls were inclined to like veggies no matter what we did. Either way, we are happy with the results! Thanks for the review and for the opportunity to win! I give my daughter veggies first then she is served everything else. Not sure it's a great strategy but it works for now. These drinks sound tasty! I'll be buying them for sure! I don't have kids yet, but I'm a picky pregnant mama to be who unfortunately never learned to love veggies. In an effort to expand my veggie consumption during this pregnancy, I've been looking for "sneaky" ways to get them into my diet. I saw these at the grocery store but my husband thought they'd be gross and we did not buy them. Now with the rave review from your girls, I'll have to try them!! The slush version sounds delicious. no kids yet but, my husband eats his vegetables haha of course. Anyway, we eat beans and rice everyday and its sure keeps us healthy! I don't have kids yet, but when I was younger my mom would make carrot bread and zucchini oatmeal cookies, which I loved! So far baby eats his fruits and veggies like a champ! Let's hope it stays that way. I try to sneak them in where ever I can. I was so happy the day I served mac and cheese for lunch and my son asked me why he didn't have any carrots and broccoli in his mac and cheese. It was a good day! My kids are pretty good about eating fresh veggies, but it means I have to do a lot of prep and I'm never sure what everyone will eat! (I have six boys.) My oldest is my pickiest and refuses to eat veggies from his lunch box, though he'll eat them at home. 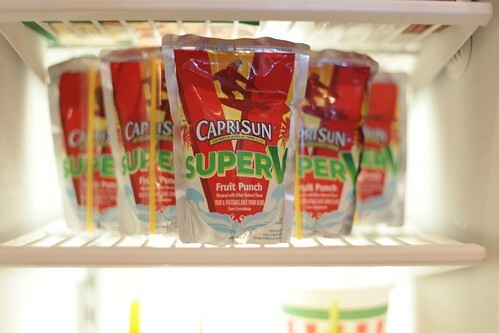 I may have to give those capri-suns a try! I am lucky and my son is a great eater and he loves fruit and veggies. When he was a baby i made all his food and when he was switching to bigger food i would take the veggie and bean purees and serve them as dip for the pretzels or other veggies. I called it dippy treat and he loved it and gobbled it right up. Now he asks for black bean dip with dinner. I do put some spices in the veggies and beans too like a little garlic powder and some mexican chili powder. just a pinch to give it some flavor! 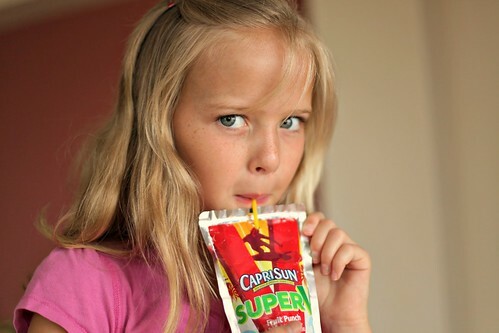 My daughter loves Capri Sun and has really liked the new ones-she's 8, but LOVES anything with fiber! I do have to sneak veggies into everything! I keep grated carrots in half-cup frozen portions to add to anything I think I can-ground beef, soups, Mac and cheese. I also put grated zucchini in brownies. The newest trick is plain Greek yogurt in EVERYTHING! I grate veggies (carrots and beets in particular) into other foods (like spaghetti sauce, soups, etc.). This seems like a great way to get kid to eat healthy without them knowing! I think it may be in the preparation. My kids will happily crunch baked kale, and cauliflower fritters fried in olive oil. If they are in a casserole they are more likely to eat them, but I don't purposely try to hide them usually. When I was a younger mother I used to hide the veggies in meals. I later learned that it is better that they help prepare the food and know what goes into the meal. The older kids will eat any vegetable. The younger ones will eat most and when they conquer a new veggie...they feel quite triumphant. I do try to buy foods that are low in sodium and sugar. Organic and whole foods full of fiber and necessary nutrients. I cook every meal from scratch and try to keep the processed foods at bay. And when I bake I use real butter and whole milk. Mine like most veggies luckily, but a sneaky way is to make a smoothie and sneak in some spinach. They can't taste it and it is so good for them! They beg me for mine! My three love for me to juice fruits and veggies for them. I have found they will take most vegetables juiced, especially carrots, bell peppers, etc as long as I toss a piece or two of fruit in the juicer with it. All three of my kids also like spinach smoothies and I add a liitle orange juice to it to make it sweeter. Oh and a glass straw!! For some reason that makes drinking your salad more fun! Love the idea of freezing them a bit to make slushies! My boys eat veggies best when cut up as a veggie tray...but they mostly just like carrots and broccoli. Well, I have found offering the same thing lots of times will sometimes win them over. But not always. We have always tried to have healthy food around. When my three year old daughter is hungry, we offer her fruits and vegetables, so those are the kinds of snacks that she wants now. I'll have to check those out...I like the thought of an added veggie & I think my kids would find them to be a treat. In our house the trick to eating veggies is letting my kiddos eat them raw. They will try and eat most veggies as long as I don't cook them. I will for sure have to try these. Two of my kids actually like V8 so these will be pretty sweet for them. Awesome giveaway! My two would love the frozen version, great idea! The kids in my family love vegetables! My daughter has always loved fruits and gets really excited to eat the vegetables from our garden. The other day she ordered broccoli; she didn't like it but at least she tried it and picked it over french fries. :) LOVE your pictures as always. Sounds delIcious and healthy too! These look delicious and so, so refreshing! Thanks for the incredible giveaway! I don't know which is cooler....the prize or the Capri Sun Super V's!! We continue to "try" veggies that someone has tried and declined before. They weren't making a lifetime decision on that one try! Also, letting them choose in menu planning and cooking has helped open their mind to new things. I have five little ones and have found that if there is something that they turn their noses up at, it's time to put it on a stick or grill it! There is something about a shish-kabob stick that intrigues them and the grill just gives everything a nice flavor! I sneak in butternut squash when I make mac-n-cheese. It makes for a creamier sauce, less dry left overs, and a more familiar orange color (like the blue box), and is super healthy. I'm loving everyone's ideas. I have one who loves fruits and veggies nad one who avoids them like the plague. We just keep offering them every day - over and over again. When she makes requests (like peeling apples or cheese on broccoli) I try to honor them. I'll look the V8 - it sounds great! Little by little, I'm trying not to be so sneaky about slipping fruits and veggies into my boys' snacks and meals. During the summer, I got them completely hooked on spinach smoothies. I had to limit them to one per day! When I grocery shop, I let each boy choose one veggie or fruit to add to the cart. It's amazing to see what they pick. They don't even ask for candy or toys anymore. Walking to the checkout, toting a huge pineapple, is the new cool! I think the best tip I know is just to have the kids try everything, even if it's just a little bite. If they don't like it - move on to the next thing. And re-try every once in a while. I know my tastes change and kids' certainly do as well! Thanks, Katy! I make sure to put at least one serving of veggies on their plates, then I try and sneak them in tiny pieces into their main dish if I can (such as in pasta sauces and in a quiche). Oh, and no dessert for kiddos who don't eat their fruits and veggies first! All my kids are grown, but I have "my littles" (grandchildren) that come over to visit all the time. I'm definitely going to get some of these!!! My kids have to have fruit and/or veg with every lunch and dinner, and at least one snack. I don't have any secrets for sneaking in the veggies. I did an interview with my 4-year-old for her recent birthday and in response to "what's your favorite food," she said, "broccoli!" If you have any tips for getting your children to sleep better, however, I'd love to hear those! I've started adding avocado to replace mayo, my son loves it, and my daughter(the vegetable phob) has yet to notice! Our healthful secrets have come about by happenstance. Finances forced us into more from scratch foods but we have been so blessed by it, as it helped alleviate many digestive disorder symptoms our family experiences. We also grow a garden and the kids (who helped tend it all summer) love picking cherry tomatoes and blackberries for snacks. I do a little of both: the kids like raw broccoli & carrots with ranch dressing, but rarely like cooked vegs. I sneak in grated zucchini and mushrooms in meat sauce for spaghetti, make pumpkin pancakes and mix pumpkin in the egg for french toast. This is such a fun blog - I've stalked it for about a month, and I'm so glad I found it! My secret is...I leave him at School/daycare for his dinner. He won't eat a vegetable at home, but at school he will. I guess it's the peer pressure. Recently, I told him spinach wraps were just plain tortillas dyed green for the holidays. Not sure how much vegetable is actually in those specialty wraps but it worked. What also helped (at least with carrots) was to have him peel them. He will eat if he peeled it. If only all veg needed peeling. I shred zucchini and freeze it so that I can add it to soups later throughout the year. It doesn't hardly add flavor or bulk but it adds a serving of veggies! I would love a 1000 dollar visa gift card. At the end of summer (or when the veggies are too much to eat at once) I boil all our left over down into a mush. It normally has squ,zuc,oni,apples, peas, beans,spinich and anything else hanging around. I freeze the results in 3 cups batches and use them all winter long in stews and soups. Kids call it veggie guop but never complain. Love slushi idea! I'm so happy to find a new juice that has no "HFCS"...so much healthier for everyone! I will buy some today. 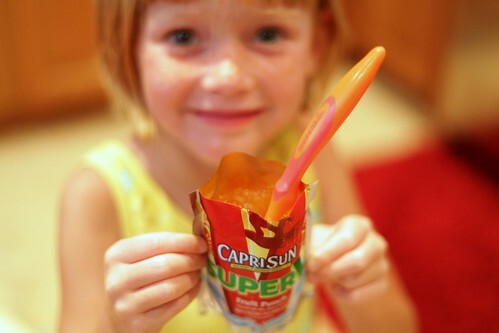 AND thanks for the tip on freezing the Capri Sun...such a great idea, yummy too. I don't have kids, but sometimes I have to sneak in veggies for myself! cocoa zucchini cake- it tricks everyone! My children are pretty open to trying new things, but it is nice to be able to hide veggies so they get even more without realizing it! It's frustrating when companies promote their product to have good sources of nutrients. Pasteruization kills all nutrients present in fruits and vegetables which leaves you with just another "sugar" drink. My children and I are sticking with water. whewww!! my baby is still mama's milk only, but i will mostly certainly give this to him when he is older! i'm with you. no high fructose corn syrup. i was shopping for STRAWBERRY JAM today &had to buy the special "natural" one because all the others had high fructose corn syrup. SIGH! My health secret--mixing what they "want" with what they need. Each day in the kids' lunchboxes I post a healthy sandwich or protein source, some fruit, some dairy and then something of their choosing-that way my kids don't feel deprived of eating all the junk their friends have packed but I know that they're mostly getting good stuff. No Lunchables around here...EVER! I'm going to give this a try. We sneak spinach in the lasagna! i puree steamed cauliflower and add it to macaroni and cheese. my boys don't notice. My son actually likes his vegetables (for the most part), sometimes I have to make him eat other parts of his meal before he can have his vegetables. I am hoping our daughter is the same way. I will have to look for those Capri Suns, my children would probably love them. I slip spinach into smoothies! 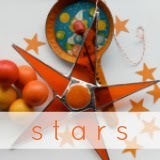 One of the reasons (there are many) I love this blog is because I'm also passionate about all things orange--in all the edible variations too. All things fruit or veggie orange make me swoon. I've considered love poems for mangos and butternut squash. However, my children sadly lack any passion for crunch and gardens and keep begging for pop tarts and Little Debbies. So I sigh often, refuse to despair, forge on and really try to forgive mom's with gifted-palate children . Hooray for Caprisun. Brilliant idea. I recently bought a juicer and it has been so amazing for us. I have been able to get my daughter to drink things that I would ordinarily never get her to eat, such as beets and kale. She loves her juices and asks for them every day! Totally impressed by how the Capri Sun peeps have responded and are now offering not only HFCS-free goodies, but partnering with V8 as well. Will totally try these sometime! I don't really have a secret. I know that there is no way to force a kid to eat something they don't like (or something they think they don't like). I just try to roll with it and continue offering nutritious foods. Luckily 3/4 children eat just about anything. The one guaranteed way to get the kids to eat veggies, though is zucchini bread or carrot cake/muffins. Those go down really easily around here. I serve my kid her dinner in courses (luckily we live in a small apartment and the distance from the kitchen to the table is not far!). Veggies first, and then down the line to the thing that she would eat the most of anyway: pasta, etc. So that way when she's hungriest she's most likely to eat the thing I want her to eat without first filling up on noodles. Looks like another fun gimmick! My trick is to saute ANY vegetable in butter and add salt and pepper. It works like a charm and my children actually eat it. Me, too, and I'm not a veggie lover. I have a child who hates 'looking' at the veggies she's eating, for example if I make a veggie lasagna, she picks everything out. SO, I shred everything. The eggplant, the squash, I mash the sweet potato and mix it in with the cheese, I super-chop the broccoli, it works so well, she asks for seconds! In my house, I have stooped to sneaking veggies into things. I know that some may say that tomatoes are a fruit, but I make a mean vegetable bisque that not only has tomatoes, but carrots and celery and whatever else I find. The trick is to put it in the blender so it's smooth. It's the yummiest tomato soup ever. Since that revelation, I tend to put other veggie into my dishes and stir them or blend them in before anyone notices. I'm lucky enough to have time to make all our bread. It's nutritious, yummy, and way cheaper than store-bought. Thanks for the chance to win! I try to sneak veggies into just about everything, as I have a teenage son who is suspicious of anything remotely healthy! I have avoided juice boxes for years because of the high fructose corn syrup--thanks for the heads up about these. I am so happy that my 2 year old loves fruits and veggies. Of course that could change any day now, but so far so good! My girls are pretty good about eating their fruits and veggies, they know that in their lunches they have to have one fruit and one veggie, and I send them with water everyday. My kids normally LOVE veggies. But, occasionally, I like to sneak in a few extra. I puree or shred veggies like squash, sweet potato, and carrots and add them to different things. I add the shredded carrots to meat loaf and any kind of red sauce. I use the purees in soups or stews. we cook veggies with lots of sauce and meat. fruits and juice are more popular. thanks for the review and giveaway. We like green smoothies, so I'm sure my kids would love these. They are going on the grocery list! we make smoothies with berries fruits and veggies! we usually put carrots celery or spinach, even though they know the veggies r there they drink it all up and ask for more. if we have any smoothie left over we stick it in the freezer and make it into popsicles! I look forward to trying these with my nieces. Thank you for the opportunity to enter - much appreciated. I make frozen pops with good stuff in them. Anything in popsicle form will fly. Mmmmmm...slushified juice sounds VERY good right now! I had no idea this existed!! I'd try it. Thanks,Katy! Yum! What a fun thing to try with my 2-yr old! I adore that you froze them for an extra treat. My 2.5-yr-old daughter will eat peas and green beans, but that's about it. My grandmother gets her to eat carrot sticks dipped in whipped cream! Not my idea of a pleasant combo, but it's worked. A little bit of sugar in exchange for something healthy. And it's starting to pay off as she's now beginning to eat them plain. My girls will eat anything with ranch on it so we take lots of fresh veggies, cut them up to make veggie pictures and then give them ranch to dip into while they are eating it all up. My kids are older (15 and 11) but they love veggies. My daughter won't eat avocado, so I don't make her but other then that they eat them all. They weren't too keen on some at first (spinach!) but I kept offering and now they like them, and spinach is even one of my son's favorites. He still doesn't really like beets but he'll eat some and that's OK with me. He might still grow to love them. In some cases it took 10 or 20 or even more tries, but it really works. I'll be on the lookout for those Capri Suns. Thanks! For the first time, I have to pack a lunch for my preschooler. I have found that doing a bento-box style lunch is the key to getting him to eat lots of different things. He loves the separation and variety of the food and his lunchbox always comes home empty! This is awesome! Capri Suns are tasty but I have a problem with overly sugary drinks too so it's nice that they've jumped on the health boat. While my kids don't eat as well as they should, they are getting better. We have days where we go to the grocery store and everyone has to pick something new to try. I often think a veggie or a fruit would be great to choose but more times than not, they choose something like mahi mahi or a new yogurt flavor. We could always get the kids to try most vegetables, but we had to let them see us eat them as well. My grandson like the idea that spinach is eating leaves, like an animal would. Whatever works, right? Definitely not a fan of HFCS, but am a fan of my daughter eating good things. She is not a fan of veggies, so if I can get them into her in an alternate way, that would be great!! We have a very short list of rotating fruits and veggies the kids will eat around here. I am just hoping they come around. I've been a vegetarian since 12, so I've never met a veggie I didn't LOVE. Thanks! A small handful of flaxseed goes into every baked sweet in my house, and oil is always subbed by applesauce! Awesome! We're obviously very careful about what we eat. My kids love veggies, but I like to sneak in more. I love having green smoothies on these hot hot days! I don't have a secret, I just give them as part of their meal! I will have to try these drinks out, thanks for the post! My healthful secret is having them help me make it. Sometimes (not always, sadly) they're more likely to eat it if they helped make it. (Trying to hide veggies in quesadillas was my biggest mistake. My two year old actually sat there picking out the bacon and cheese, eating them, and leaving all the vegetables and the tortilla). I don't have kids of my own, but at the library, I find that kids respond really well if the snack I try to give them has a cute story or is in some way kitschy. For instance, we had a snack the other day that was a tortilla spread with peanut butter, sprinkled with granola, topped with a banana, and then rolled up and topped with more granola and some honey. We called it bananas in a blanket and it went with the stories and crafts for that day. They loved it! I juice strawberries, spinach, & cucumber and then freeze that into popsicles! We do the sneaky thing for my three year old now, but I also try to get him used to veggies by offering them at every meal I can. Thanks for the chance to win! My kids LOVE their fruits and vegetables. My friends are often shocked when my girls choose veggies over processed foods... funny thing is- I am not a fruit/veggie kind of gal- it is all them! DDs love fruit smoothies, they don't care or have no idea what veggies I sneak in. This has likely been mentioned already, but we serve up green smoothies around here. We also chew our vegetables, but one way to help the medicine go down is calling it by some other name - e.g. spinach leaves=rabbit food; green pepper slices=pepper sticks, etc. I'll have one kid going to "real" school now, so we'll also give these capris a try. We always have a veggie at dinner- and usually the more unique it is the more "fun" it can be. I also put a huge container in the fridge of cut up veggies that they can eat ANYTIME they are hungry. I figure if they fill up on veggies so they can't eat a full meal with us that is a-ok in my book! I have to hide a lot. I have a son with autism and the texture of most veggies freaks him out. He wants to try it but ends up spitting them out. So he gets his all sneaky and probably drinks most of them, he loves these as does my 7 yr old. We don't allow HFCS in our home! My second idea (and for a second entry) is that we eat A LOT of soup. Soup is (a) easy, (b) made with water and Better than Bouillion fat-free base, (c) only includes the fresh veggies and meat that we want, and (d) is SO tasty. For a working mom...soup's the deal! I am super lucky to have a niece that just adores fruits and veggies! She loves the sugar-laden sweet stuff too, but when you see an 18 month old eating asparagus like there's no tomorrow, its a pretty awesome sight! My older daughter used to love vegetables. They were the only thing she'd consistently eat at meals. But then people started going on and on about how cool it was to have a kid who liked vegetables, and television shows aimed at preschoolers dedicate entire episodes to kids hating vegetables and being forced to eat them, and she picked up that vegetables are something you're not "supposed" to like. She still doesn't eat much meat, and doesn't like bread or crackers, but now on top of that she refuses to taste her vegetables that she used to love because society has placed so much emphasis on "kids hate vegetables". Yeah, I'm a little bitter about this subject. My other daughter has always hated them and I just do my best to get her to at least try them, but she hates fruit too so it might just be a texture thing for her. I have a great recipe for banana muffins, but love to add carrots and broccoli to it. It's great :) The kids love it and all you can taste is the banana! Our biggest secret is the basic switch to whole wheat. I'd even drink or slurp those. Looks good. My mum was a "mean mum" when I was little because she never let us have fruit roll ups. I'm grateful to her now. I sneak in "health" food by doing homemade soda. My son loves the bubbly stuff. So I mix 3 parts organic fruit juice to 1 part seltzer and voila! My only little one just turned 6 months old, so we just just started solid foods. I'm hoping by only offering healthy fruits and veggies at the beginning, she'll learn to love them for a lifetime! I get my 2yo to eat spinach by sneaking it in her smoothies. She has no idea! I try to bring out veggies as snacks whenever I can- a tiny bit of dressing as dip goes a looooooong way with raw veggies. I also offer my kids bites of veggies as I'm preparing the vegetables to go into meals, which makes my kids eat vegetables both before and during meals. They love to snag peppers or tomatoes (even raw onion and garlic) or whatever else I'm cutting up off the cutting board as I'm getting dinner ready. I think they like the illicit quality of the stolen snack. I puree veggies and add to sauces and other dishes. I always have them as accessible as possible and always the snacks throughout the days!